With vRealize Operations 7.0, VMware introduced a very simple yet powerful feature which would allow you to reset the built-in admin password of your vRealize Operations instance using recovery settings. I believe this is an extremely useful feature, as I have seen numerous deployments where admins have forgotten the admin password and are forced to login through the root account and run commands to reset the password. Note - You can follow the procedure mentioned in this KB article to reset a forgotten admin password through SSH. I would rather use this new feature and keep the password recovery process as simple as possible. Simple in this case provides security as well, since you do not have to share root passwords and run commands. With vRealize Operations 7.0, once you login to the CASA (Cluster Administration) UI a.k.a. Admin UI, you will find a new section called "Administrator Settings". This screen allows you to "Change Admin Password". 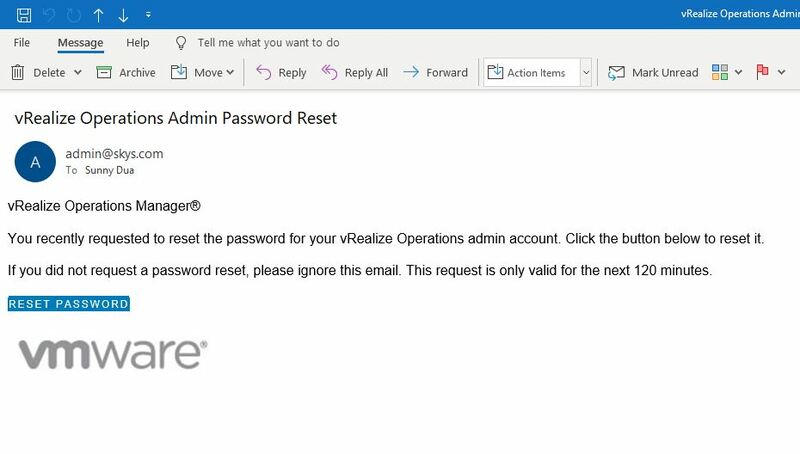 At the same time you can enter the password recovery settings to ensure that in case you lose your admin password, you can use the recovery email to recover the password. In the above example, I have leveraged my SMTP settings to configure this. Once saved, on subsequent admin login screen, you will notice an option of "Forgot Password"
Upon clicking on the reset password link, you will be redirected to a page where you can reset the admin password. Once the password is SET, you are good to login with the new password in the subsequent logins. 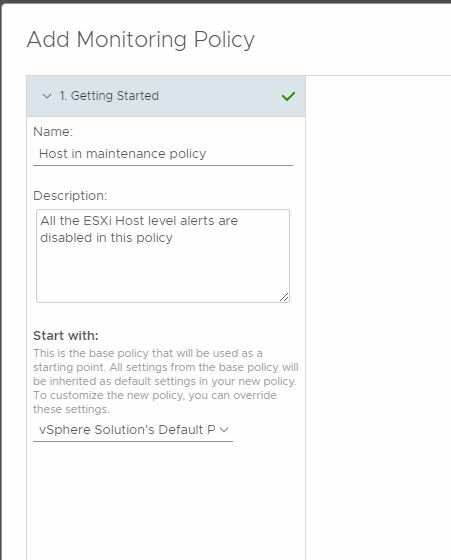 Use Case - An administrator wants to disable alerts on a ESXi host which has been put into maintenance mode in vCenter. This is to avoid any alerts on this ESXi hosts inside of vROps, while the admin wants to continue to collect the metrics on this ESXi host. Goal - The goal is to do this automatically without any manual changes in vROps. As soon as a host goes into maintenance in vCenter, vROps should know this and should stop alerting on the host in vROps. Solution - This can be achieved by using Custom Groups and Policy and a one time configuration. 1- Create a new policy in vROps named "Hosts in maintenance policy". This policy can be created under the default policy. 2- Select the default policy and click on the + sympbol to add a new policy. 3- Give it a name and description as shown below. 4- Click on Alerts and Symptom Definitions and filter the list of aletrs with only host system alerts. We want a filtered list so that we can disable these in one go. 5- Now press CTRL + A on the keyboard to select all of them, you can also click on Actions -> Select All. 7- Click on Save and now you can see he new policy under your default policy. 8- Create a new custom group named "Hosts in Maintenance". Use the following creiteria to dynamically add members to this custom group based on ESXi host property which vROps collects every 5 minutes. Click on Environment -> Custom Groups -> Click on the + Sign to add a new custom group. Make sure to select the policy "Hosts in maintenace policy" which we created earlier. 10 - Finally go into Administration -> Policies -> Active Policies and set the newly created policy at priorty 1 rank. Now, as soon as you will put hosts into maintenance mode in vCenter, within the next 5 minutes they will be be discovered as being in maintenance inside vROps and they will be added into the cutom group. Once they are a part of the group, the maintenance policy with all alerts disabled will be applied to these hosts and you will not see any alerts on them in vCenter, till the time they are in maintenance. Once they are out of maintenance, they will be moved out of this group subsequently. All of this would no longer require any manual intervention, once configured. Do note, that if you add any new alerts (in future) related to hosts, you would need to make sure that they are disabled in this policy. Share and spread the knowledge.. There have been several amazing changes in the realm of dashboard management in vRealize Operations 7.0. The very first one in my list of favorites is the ability to transfer dashboard ownership. In the previous releases of vRealize Operations, one can create and share dashboards, however if a user must be removed from vRealize Operations for any reason (leaving the organization or transferring to a new role), he/she would not be able to transfer the ownership of their dashboards which they have created. This means that, in order to maintain their dashboards, one has to clone them and reshare them, which can be painful if you are dealing with a number of dashboards. Our awesome engineers decided to reduce this pain by introducing a simple button in the UI to seamlessly transfer the ownership of dashboards. So now if a user is planning to leave, he/she can easily transfer their dashboards to other users or the built-in admin account. This solves a big operational hassle. 1- Click on Dashboard - Actions - Manage Dashboards. 2- Select one or more dashboard from the dashboard list which you want to transfer the ownership for. 3- Click on the actions tab and Transfer Dashboard. 4- Select the user to whom you want to transfer the ownership. 5- Click on Ok to confirm transfer. Another important thing to note is that the built in "admin" account has permissions to transfer the ownership of any dashboards. In another post I am writing, I will share details around managing content of a user (dashboards, report schedules), who is accidentally deleted from the list of users. Stay tuned for that one as well. One of the less known feature of vRealize Operations is to visualize data patterns and compare them against previous time periods of same interval. This feature helps you to easily detect changes in behavior of a workload a.k.a anomalies which could be a result of an event leading to an underlying performance problem. Let's explain this with an example. I am currently looking at the CPU Usage of one of my virtual machines here using a metric graph. This is the last 7 days worth of data showing the regular patterns of how CPU is being used. You can see the peaks and valleys. Upon observing closely, you can see that the data patterns are pretty consistent. Imagine, I need to quickly look at how was the behavior of this metric at exactly the same time-period A WEEK AGO. I want to compare to see if things have changed, or is their any anomaly in the data pattern..
Let's click on GO and see what happens. oooh.. look at that, I am now comparing to a previous period.. But this seems a little harder to compare in this mode. Bingo... Look at that... We immediately found atleast a couple of data points where the CPU Usage is abnormal as compare to what it is this week. Let's get one more week in by adding "previous period 2". Easy Peasy... A quick and easy way to get value out of vRealize Operations. Well, I hope this gives you some ideas to how manual troubleshooting which ofcourse is a day to day operation done by admins and architects can become increasingly simple yet effective by using these hidden gems or vRealize Operations.